Celery -- scientific name Apium graveolens -- is a plant whose crisp green stalks are eaten both raw and cooked. Native to the Mediterranean region, it's been cultivated since ancient Greek times. Celery is a common component of weight-loss diets, as it's low in calories and high in nutrients. Celery seed is also sometimes used as an herbal remedy. 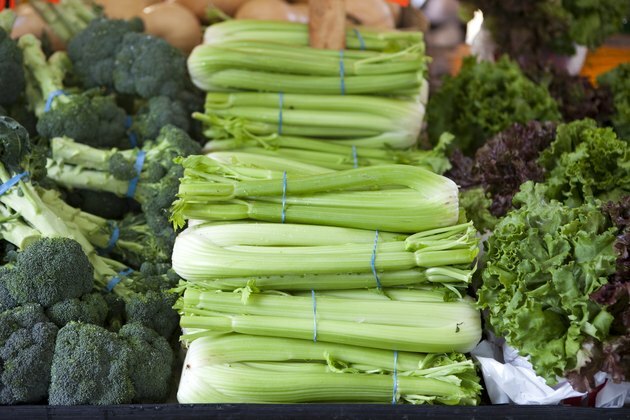 There are some health concerns regarding celery, however, that you should be aware of. Celery is a very common allergen and reactions to it can be life-threatening. If you're allergic to birch pollen or mugwort, you're also likely to react to celery. Symptoms can include itching and rashes, swelling of the face, mouth, tongue and throat, dizziness and stomach upset. A more severe reaction called anaphylactic shock is marked by lightheadedness, a drop in blood pressure, rapid pulse and difficulty breathing. Anaphylactic shock is a serious medical condition that can lead to coma and death. Cooking does not affect the allergenic potential of celery. Celery contains several compounds known as furanocoumarins. These chemicals cause skin to be photosensitive -- that is, sensitive to bright light, especially sunlight. Usually this reaction happens due to intensive handling; it's common among agricultural workers, for example. However, Dermanet New Zealand reports that "occasionally, ingestion of these chemicals in celery soup can cause generalized sun sensitivity; several people have developed severe sunburn after eating celery soup and then going out in the sun or to a tanning salon." Celery is both rich in water and a natural diuretic. Therefore people with kidney problems should monitor their celery intake, as excessive consumption might put extra strain on their kidneys. Consult with a doctor if this is a concern of yours. Pregnant women should avoid large doses of celery and celery seed as it can induce bleeding and uterine contractions. Occasional consumption as part of a well-balanced diet is not an issue.